Access: On the Menu bar, click View > rayCloud to open the rayCloud. In the toolbar, click the button . The right sidebar is displayed on the right of the main Window. 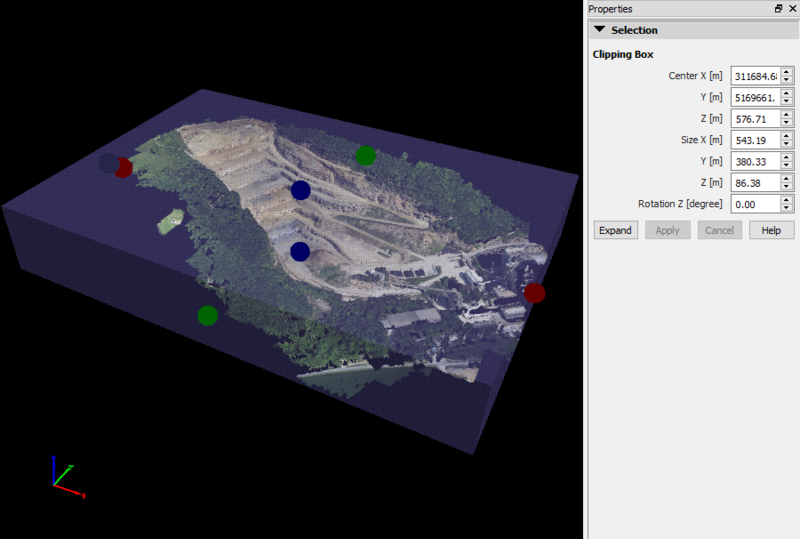 The Clipping Box is displayed in the 3D View and the Clipping Box Properties are displayed in the right sidebar. Note: The Clipping Box only affects the display, not the results of any outputs of step 1. Initial Processing, step 2. 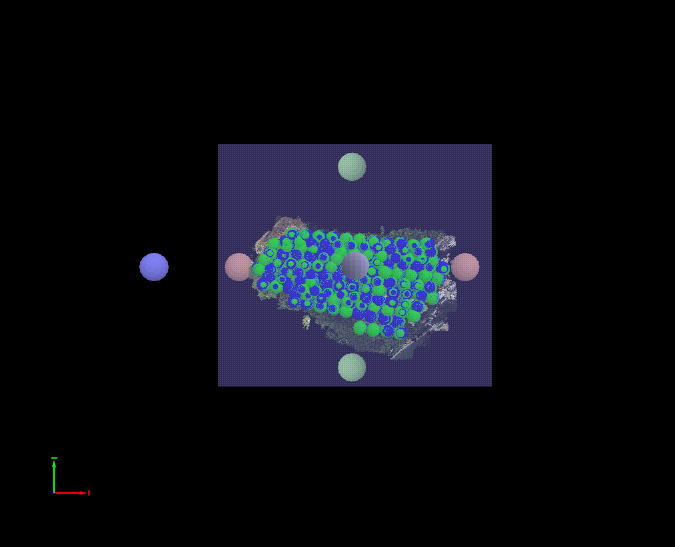 Point Cloud and Mesh or step 3. DSM, Orthomosaic and Index. Center X [m]: Relative X coordinate of the center of the Clipping Box. Y [m]: Relative Y coordinate of the center of the Clipping Box. 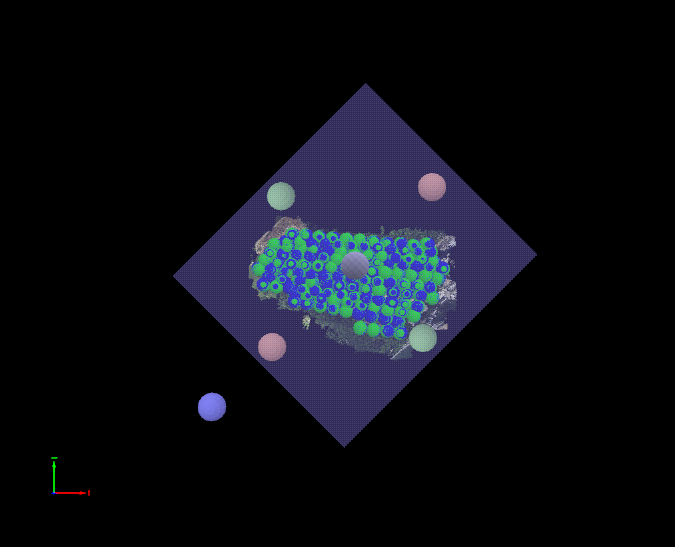 Z [m]: Relative Z coordinate of the center of the Clipping Box. Size X [m]: Size in meters of the X side of the Clipping Box. Y [m]: Size in meters of the Y side of the Clipping Box. Z [m]: Size in meters of the Z side of the Clipping Box. The X axis of the model and the X axis of the Clipping Box. The Y axis of the model and the Y axis of the Clipping Box. Expand: Creates a new Clipping Box which covers the full model. Apply: Applies the changed in the values of the properties of the Clipping Box. Cancel: Cancels the changes in the values of the properties of the Clipping Box. Note: On the toolbar, applies the Clipping Box in the 3D View and visualizes only the area contained in the Clipping Box. For step by step instructions about how to use the Clipping Box: How to use the Clipping Box in the rayCloud.